The comics I got for Christmas had been sat on the shelf waiting patiently for too long. 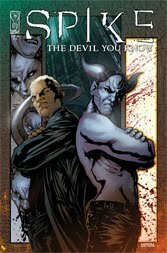 Time to read them, starting with Spike: The Devil You Know. This seems to be a short spin-off story from IDW's After the Fall. However it appears to be set after After the Fall. Again IDW's release schedule fails to make sense, how can this be out when the full After the Fall run isn't all out in paperback yet? I have no clue. Still it doesn't effect the enjoyment of the story. It's one of those standalone pieces which doesn't require you to know what has happened previously, it only requires you to have a basic knowledge of the characters involved other than the newly introduced ones of course. The art here is good as is the story, although it's not my favourite. As interesting diversion with Spike beating up lots of demons. A couple of threads are left open for a possible continuation but I'm not sure that will ever happen. I know the rights for Angel have now passed back to Dark Horse. I don't actually know where Spike fits in all that but I expect he's back in Buffy Season 9 now and IDW's Whedonverse comics are at an end. Still have to wait until August before volume one of Buffy Season 9 is out in paperback though.